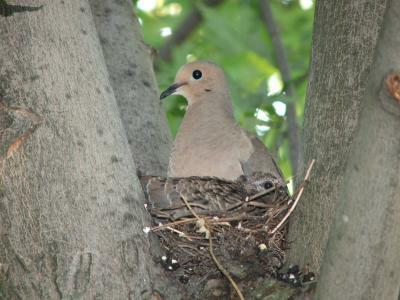 There was a dove's nest in the crook of our maple tree and inside were two babies and their mom. I took this photo right after the father coaxed one of the little one's out for it's first flight. Mom stayed behind and was all lovey dovey with this little one until it was ready to make it's first flight too! You certianly captured nature at it's best. this picture gives me a peaceful feeling.